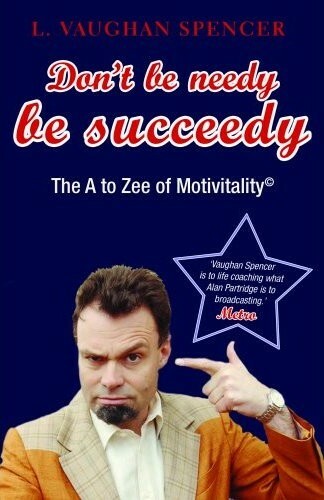 Don't Be Needy Be Succeedy: The A to Zee of Motivitality? Here are selected snippets from your reponses to the survey. • He's the wind beneath my wings. • He's not needy, neither greedy nor too reedy but in fact very succeedy! • No one has done more for buzzness than L-Vo, he's turned me from a non-achiever to succeeder! I'm still unemployed though. i'm in love I'm a believer! I couldn't leave him if I tried! • He speaks the truth. How do I know? Because there is truth in comedy and when I read L-Vo's advice I laughed, a lot. • He shows us how to improve our ways through his general likeability and humor. his experiances show us how to improve and also, how to have fun while doing this, because with out fun would be a dull one. So if we laugh along the way, it will stay with us. • That book was ace! I'm gonna use it to teach Business English to my, um, Business English students here in Mexico. I think they will learn a lot.